Yesterday evening my husband and I were at the grocery store all by ourselves. My mother had asked to spend time with her grand kids before church so we were alone for a few hours! We ran an errand for the church and while in town, we stopped at the store. There was a big bin full of sloppy joe sauce. My husband said, "Mmm, I think I would like some of that for supper!" I looked at him with a sly smile... I said, "Ok, except we won't buy the sauce, I'll make it." He laughed and said something like, "Oh yeah, we don't buy things like that." And so we finished our errands and went home. At home I browned up a pound of ground beef with a chopped onion. Mix well into ground beef and let thicken slightly. Serve immediately and on buns if you wish. There you go. One more 'can of stuff' you can eliminate buying because you can make it easily at home! That sloppy joe sandwich looks So. Good. 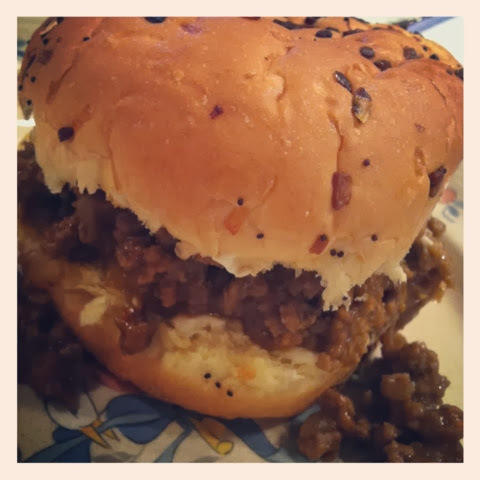 I wish my husband like sloppy joes; I love them! Your sauce looks fantastic too. Have you ever tried to can it? Add soup to heated beef, bring to a boil and then add the flour. Stir until thick, a gravy like consistency. Serve on onion rolls or any type of roll. YUMMY & easy!